Personal social network Path is opening up its API to 13 new content partners enabling those services’ users to share their activity as private moments. The selected applications include WordPress, video sharing service Viddy, fitness app Strava, the Bible app, and more. This is the company’s first foray letting more services tap into its platform. Until today, Path had only allowed one company to tap into its exclusive API: Nike. With the service’s app and Fuelband, users were able to share their workouts and scores with their friends. The new applications will follow suit with what Nike currently is doing, meaning that users of these new content partners can push their information right to Path. So what are the 12 new services that have been granted access? Besides the four stated above, the list includes Over, PicCollage, PicMix, Papelook, Mill, Manga Camera, Otaku, PicFrame, and PicStitch. As you can see, most are photo-related. However, Viddy is the sole video service introduced this time around, along with Strava, the Bible, and WordPress. With this update, Nike no longer has a monopoly on Path, as Strava enters the picture. Fans of the app can post their run and ride activity to Path just like they could with Nike+ Fuelband. Path is a fantastic mobile social network, and as more and more people use WordPress as their digital hub — a place to author all their content and then smartly connect WordPress with their various social networks — it made perfect sense to add Path into the mix. The sharing of posts is powered through WordPress’ Publicize feature, which lets content creators share their work automatically on social networks like Facebook, Twitter, Tumblr, and LinkedIn. Now it’s being used to tap into Path and so when a new post is published, just like with an RSS feed, a “moment” will be shared on Path. Path users interested in this integration can connect their WordPress.com site to Path through the Settings screen in their dashboard. 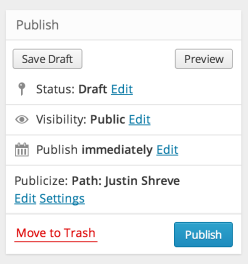 Once it’s been authorized, you’ll be able to see an option in the publish section of the editor. Not all posts need to be pushed to Path — you have control over what you want to share by opting out at any time. This feature works with those users who self-host and if you’re on WordPress.org, connecting to Path can be done through the latest version of Jetpack. What WordPress offers is similar to what users are now able to do with the Bible. Users can extract a specific proverb, psalm, or reading from the holy book and easily add it as one of their precious moments — all without needing to copy and paste it. Many, if not all, of these new partners were already able to share their content on Path before, but not directly. Users could save the final image to their device camera roll and simply import it. This would normally take one more step, but now instead of posting content to Facebook and then repeating the actions on Path, users could do it right from the source app. While it may seem like Path is opening its API to one and all, don’t be fooled – only a small number of apps are being allowed in for now, which have been specifically selected by the company. With such a personal social network, it needs to be delicate in who it lets in, to prevent an overabundance of “noise” in people’s feeds. We spoke with Path’s Vice President of Business Matt Van Horn, who mentioned that these applications were chosen based on the activities people were trying to share on the social network. Many were taking photos and screenshots of fitness activity, maps, what they were listening to, and other interesting items and posting it to Path simply because there wasn’t any other way. 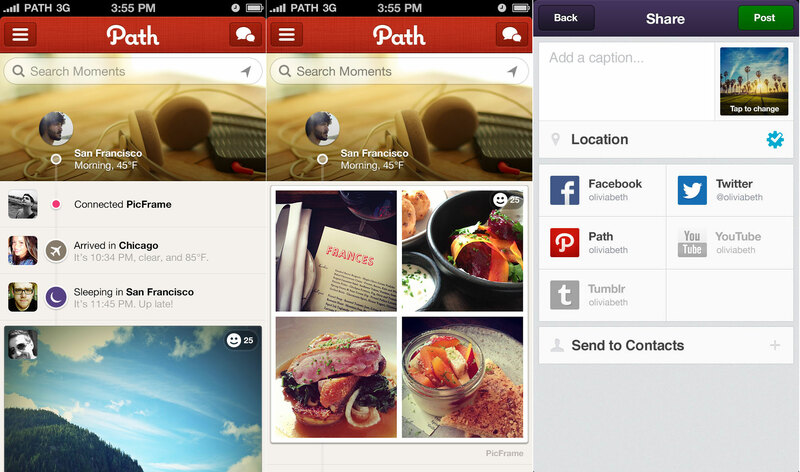 With more than 12 million users, Path has been adding new offerings to help with engagement. Most recently, it has been on a spree adding stickers to its iOS and Android apps, as well as extending its reach by launching on Kindle Fire and Windows Phone 8. And it all comes on the heels of a report that Path is approaching a $1 billion valuation while continuously defending itself from critics who claim that it is spamming friends of users. Earlier this year, the company also paid a $800,000 fine to the FTC over underage signups and unauthorized iOS contact data collection.